After posting our inaugural lobster roll report from The Clam Shack in Kennebunk (a pre-Lobster Roll Chronicles visit very early this year), Facebook pal Jeff Beck asked how it compared to Red’s Eats in Wiscasset, ME. It took a Google Maps search for us to realize we’ve driven by Red’s many times and always noticed a long line, but we figured it was just a local hot dog joint or something. Boy were we wrong! Red’s is one of the few 800 lb. silver back gorillas in the world of lobster rolls. Red’s Eats was named in “1,000 Places to Eat in the US & Canada Before You Die,” USA Today’s “10 Great Places to Eat Regionally, Eat Well,” and “500 Things to Eat Before its Too Late.” You get the idea. But we thought, “How could it be better than The Clam Shack?” (At this point, one of us still held Rye Harbor Lobster Pound in 1st place.) It wasn’t. Each of us actually scored both places exactly the same, bringing them each in for a tie for 2nd Place for Best Lobster Roll in Northern New England. 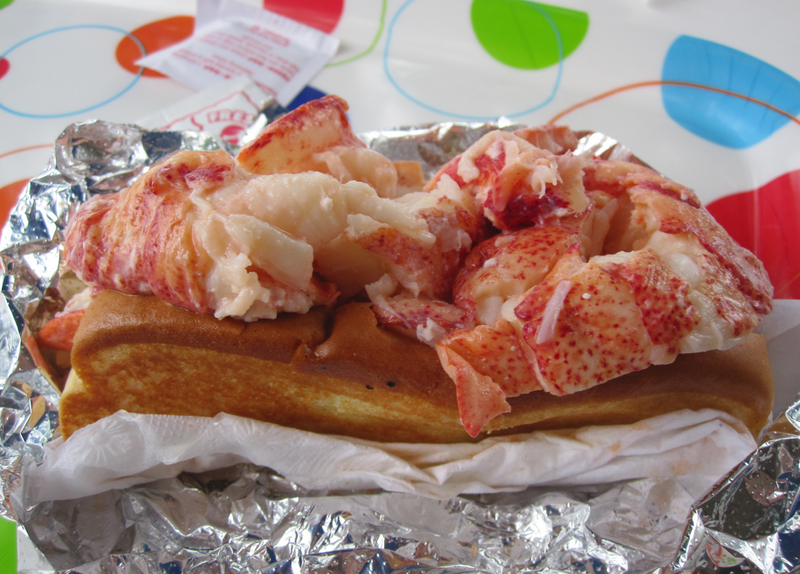 Red’s uses at least 1 and 1/2 lobsters in every lobster roll. Their bun is a wonderfully soft, grilled split-top hotdog roll heaped with some of the most delicious lobster meat you’ll ever have. The lobster is served with light mayo, but also with a side of melted butter – the secret weapon in lobster roll greatness (mayo AND butter, that is – The Clam Shack also uses this method). We got to Red’s at around noon on a weekday, and found ourselves in line for about an hour. This is something you should expect if you visit Red’s… they’re just that good. But as we waited patiently in line, we were served various complimentary treats from the kitchen, including fried shrimp. This is the line that awaited us on the day we stopped by Red’s Eats. We mentioned that the Red’s embraced the mayo + butter approach (although the butter at Red’s in on the side). We found this to be a consistent winning formula, even when the butter-grilled bun delivers the butter portion of the recipe. The other differentiator between places like Red’s and the wanna-bes is the use of claws, knuckles AND tails. When compared with the abysmal rolls by places like Neptune Oyster, we believe 100 out of 100 people would choose Red’s. So, there’s a note to all you aspiring chefs – from roadside line cooks to exec chefs with three Michelin stars – DON’T OVERTHINK THE LOBSTER ROLL! Use truly fresh ingredients, light mayo, top-quality roll, melted butted (either within or without), and end it. No celery, no apple, no lettuce. And, of course, every roll is made to order. Visit Red’s to see what we mean. 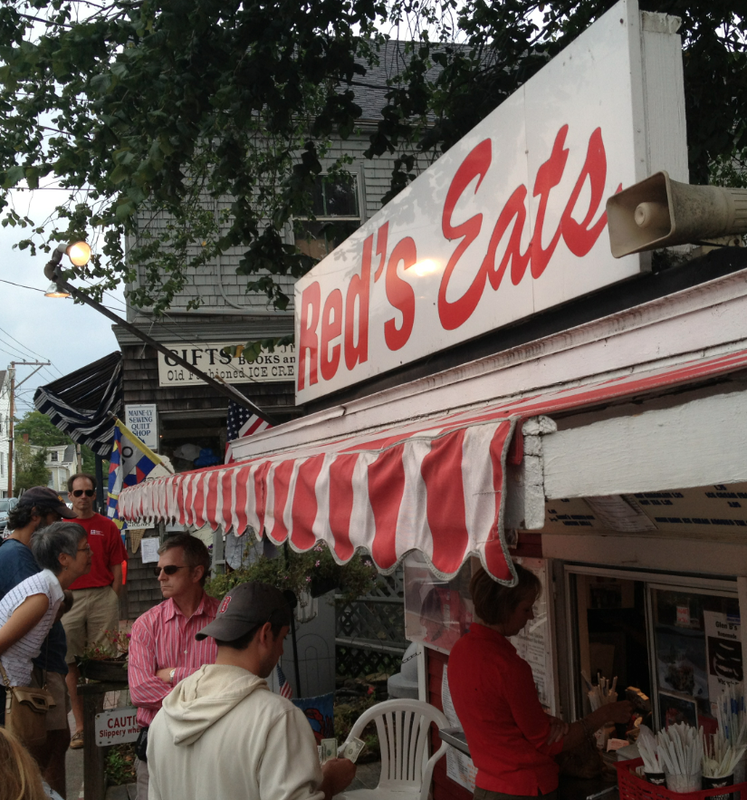 Red’s Eats can be found at 41 Main Street in Wiscasset, ME. FACEBOOK: https://www.facebook.com/pages/Reds-Eats/175139778087?fref=ts. PHONE: 207.882.6128. Check their schedule, as Red’s is a seasonal business. Our snap of the Red’s lobster roll came out fuzzy, so we borrowed this snap from Marcrescue. We’ll be happy to remove the image upon request.